Sugar cookies are great. We especially love those super soft pillowy ones with the colorful thick frosted tops. Well, we are here to tell you that softness can be found with sweet potatoes. 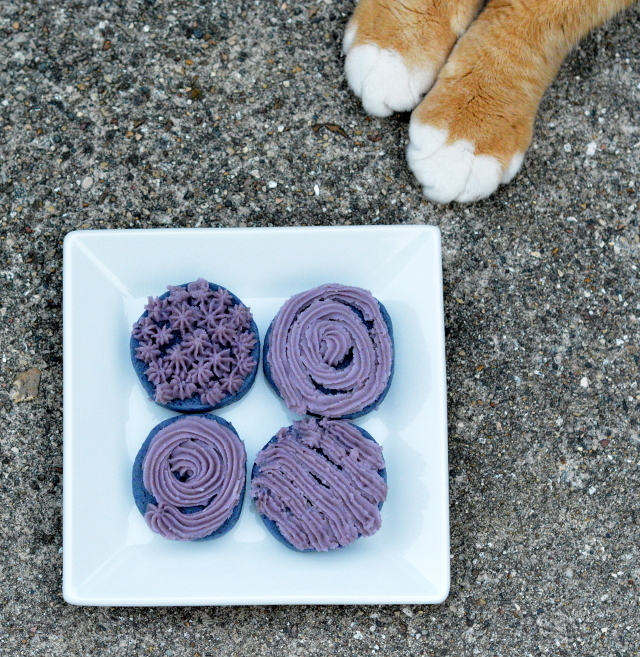 A softness we found from ube treats at Warm Belly. This recipe is partly inspired by their ube creation. 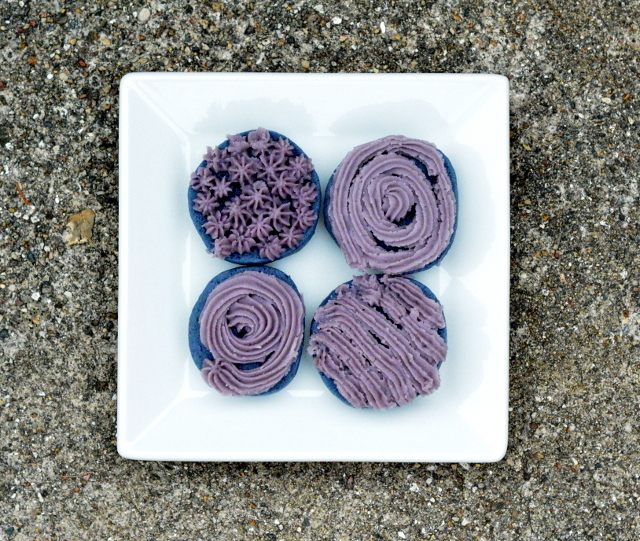 We took our classic sugar cookie recipe and transform into ultimate ube cookies. In case you don’t know, ube are a variety of purple sweet potato. Some people classify them as yams. The takeaway is that they are a deep purple and delicious. The flavor is sweet potato but with vanilla, floral, and nutty notes. Some people say it tastes like white chocolate, just one of the reasons we used it in the frosting. Why you want to use ube? Ube is a healthy substitute for fat and sugar. 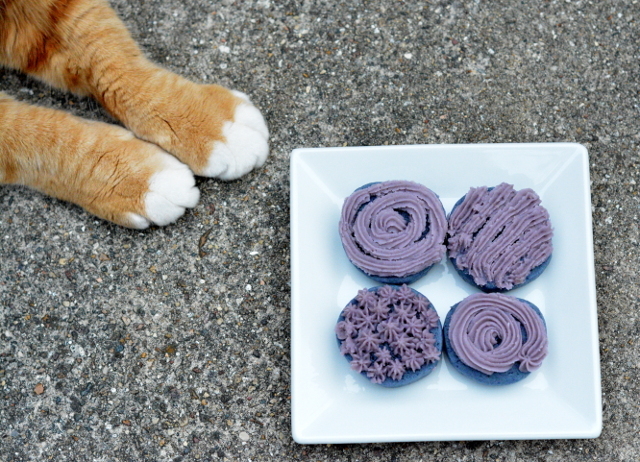 Ube is a good source of fiber. So following our list, we substituted roasted ube for half of the butter. They will still be super soft and delectable. As well as cat bait. Our cat could not wait to try a cookie because he is all about those tasty carbs. He doesn’t normally care about what we’re making. 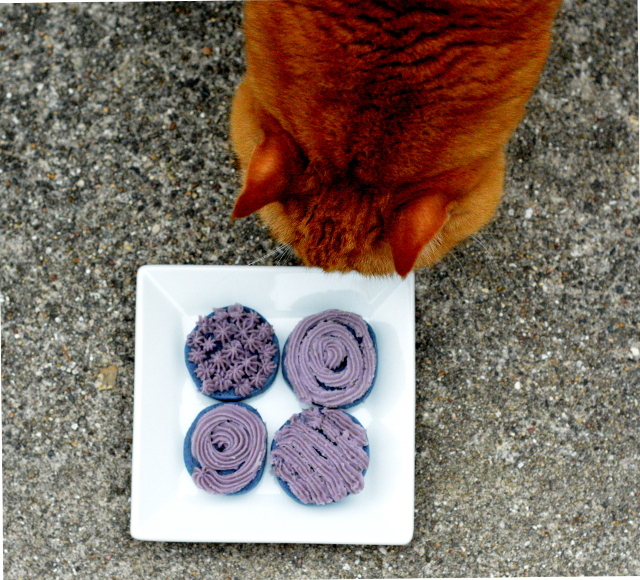 However, he sat pretty and begged for ube cookies. We think he is weird too. Back to our recipe, this is essentially quite similar to our sugar cookies. Only with roasted ube. Roasting generally takes anywhere from 45-60 minutes at 400°­­F. Wrap them in foil and let them go until soft. You will want all your ingredients prepped though as the frosting needs to be made with hot roasted ube. Luckily, roasted sweet potatoes peel easily with the help of a towel. The cat again wanted to help, but he also wants to eat grass. So, we rejected him, but he can’t resist cat bait. A healthier and prettier version of our sugar cookies. 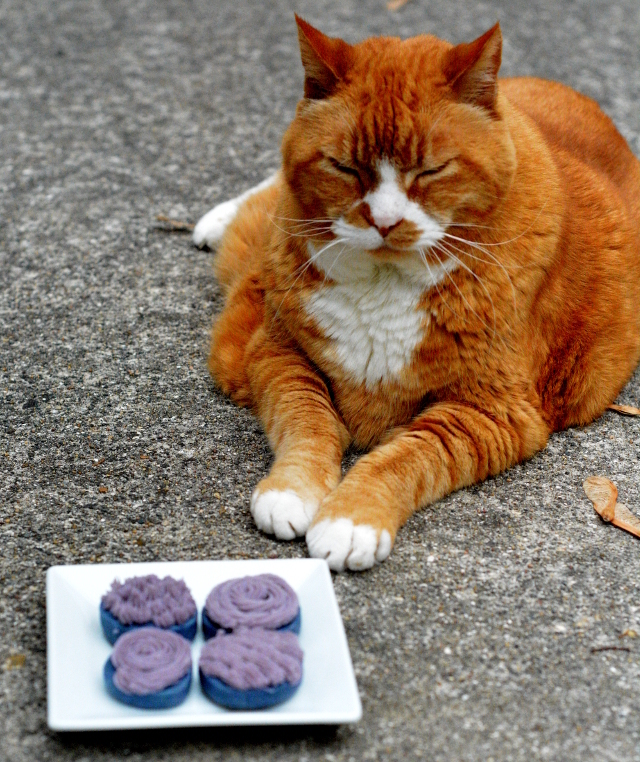 Ube cookies are soft like pillows with their own addictive flavor. Mix wet ingredients before adding in your dry ingredients. Add food coloring if desired. Some ube are less vibrant so you may want to punch up the purple. Divide in half. Roll each half into the desired size log. Wrap in plastic before chilling until firm at least 30 minutes. Slice cookies roughly 1/2 inch thickness. Rotate the logs to maintain circular shape for each cookie. Bake at 375°F for 6-8 minutes. Mix in food processor hot ube and white chocolate until melted. All the chocolate should be melted. Chill before using to frost. Lager cookies will have softer centers. Ours were roughly 1 inch circles. Bigger may be better. After frosting store cookies in the fridge as the cooked ube frosting will keep longer chilled.